June 2017: Performed Christine in Return of the Phantom at an orchestra sitzprobe and run through of the new musical at Broadway Theatre of Pitman. June 2017: Wishing a happy closing to The Fantasticks after 57 years! 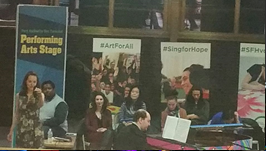 April 2017: Sang a few jazz tunes at Sing for Hope cabaret. 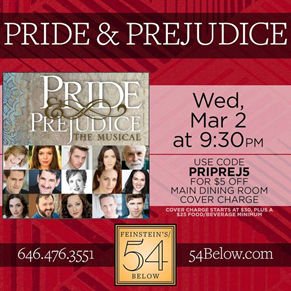 March 2016: Premiered at Feinstein’s 54 Below in Pride and Prejudice the musical by Lawrence Rush! February 2017: Played Ellie and operatic soprano in a reading of The End by Robert Koutras at the Workshop Theatre, directed by Emma Gilding. 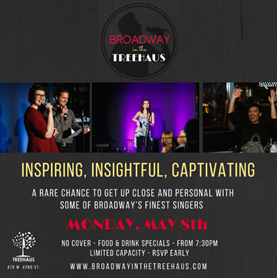 June 1, 2015: Rita and other Broadway vets raise money for special needs campers at Broadway Live Katz JCC benefit! Nov - Dec 2014: Rita was a soloist in a Viennese Christmas East coast tour with the Hollywood Concert Orchestra singing songs from various operettas. Venues ranged from Florida to the Northeast and included the Tilles Center for the Performing Arts in New York and the State Theater Center for the Arts in Pennsylvania among others. July 21, 2014: Rita performs Time at a benefit for The Humane Society of New York! Rita's two regional productions from the 2012-2013 season both got nominated for their area's Best Musical Awards!! They include Sweeney Todd at Portland Center Stage (Portland Area Musical Theater Awards) and The Immigrant at Seven Angels Theatre (Connecticut Critics Circle Awards). May 16, 2013: Rita plays Lucy Mercer in a reading of Einstein and The Roosevelts, a new musical, by Gretchen Cryer and Nancy Ford. March 21-April 21, 2013: Rita plays Leah in The Immigrant at the Seven Angels Theatre in Connecticut. March 4, 2013: Rita joins the creative team of Casanova for a reading of The Countess of Storyville in collaboration with Amas Musical Theatre. February 7, 2013: Rita joins an acclaimed cast for the premiere of a staged reading of Casanova, a new musical, as Jacqueline, Casanova's daughter, at the Players Theatre through Amas Musical Theatre, with direction by Gabriel Barre. February 2013: With A Song In My Heart will play at the Hedgerow Theatre: Feb 1 at 7:30pm, Feb. 2 at 8pm, and Feb. 3 at 2pm and at the Broadway Theatre of Pitman (NJ): Feb. 14 at 7:30pm, Feb. 15 at 8pm, Feb. 17 at 2pm. With A Song In My Heart is a beautiful revue filled with the wonderful music of the 1920s, 30s, and 40s. November 2012: Rita played Venus Humplewhite in a reading of a new play, Synchro, directed by Gabriel Barre, and with a cast that included the talented Jill Paice and Eden Espinosa. September 18 - October 21, 2012: Rita stars as Johanna in Sweeney Todd at Portland Center Stage with a wonderful company of actors. Click here to watch a short video spot of Sweeney Todd! Rita performed in With a Song in My Heart>, A Musical Revue, singing classic songs such as "The Boy Next Door", "The Trolley Song", "You Can't Get a Man with a Gun", and many more, at Society Hill Playhouse (507 S. 8th Street, Philadelphia) from June 8 - 17, 2012. Rita played Mary-Frances in Something For the Boys at the Lion Theatre on Theatre Row (410 West 42nd Street, NYC) from May 1 - 13, 2012. 2/12/12: Rita was on the radio show In the Life with Steve Stanulis which will air live on Sirius radio and can be later viewed on YouTube, www.madmicradio.com and www.pseudo.com. 2/4/12: Rita was a judge for the Manhattan Monologue Slam in NYC! 1/31/12: Rita wrapped a TV pilot shoot for Stories from Astoria playing Denise, a girl involved with the Greek gangs in the 80's in Queens, based on a true story. 10-11: Living the Dream, a film written and directed by Columbia University MFA candidate, Gerry Kim, is currently in post-production. Rita plays the lead role of Violetta. 05-11: Rita played Lorelei in a staged reading of Into Brightening Air, a new musical, by Brian Cavanagh-Strong and Scout Storey at the NYU Graduate Musical Theatre Writing Program, directed by Daniel Winerman. 02-11: The cast album recording and photos for Muscle-man vs. Skeleronman: A love Story: The Musical directed by Richard Hinds, can be found Here! 01-11: Rita receives a BroadwayWorld Philadelphia Awards nomination for her role as Tzeitel in Fiddler on the Roof at the Walnut Street Theatre, in addition to her Barrymore nomination!